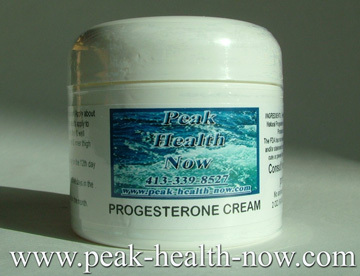 Peak Health Now Progesterone Cream is enzymatically processed from wild yam to yield a compound that is bioidentical to human progesterone hormone. This formula is made with bioidentical USP quality Progesterone. Dr. John R. Lee, medical doctor, researcher and author, states that in doses of 20 - 30 mg, bioidentical Progesterone in a topical cream can offer relief to women with signs of estrogen dominance. These include depression, weight gain, lowered libido, hair loss, hot flashes, fatigue, irritability, water retention, mood swings, etc. At the laboratory I employed to put together this formula, years of experience combining clinically tested skin care ingredients with micronized natural USP Progesterone created a simple easy to use crème. Lanol is blended with Aloe Vera in a Transdermal Delivery System. Lanol is one of the most excellent cosmetic moisturizers and reputed to maintain youthful appearance. Aloe vera is known worldwide for its capabilities to hydrate and heal the skin. Suggested Use: ¼ teaspoon of creme provides 20 mg of micronized natural progesterone USP. For best results, apply to skin areas that are relatively thin and well supplied with capillary blood flow: upper chest, neck, inner arms and inner thigh areas. IMPORTANT: Rotate among 3 - 4 different application areas of the body daily. Pre-menopause: Apply daily ¼ teaspoon creme for 14 days beginning on the 12th day after the period starts. Repeat monthly. Use additional creme and more days if needed. Women who are menstruating should take at least 5 to 7 days off each month to allow period to begin. POSTMENOPAUSE: Apply daily 1/4 teaspoon for 21 consecutive days in the month. Repeat monthly. Use additional creme and more days if needed. In addition to this premier Estriol Cream Formula, the Peak Health Now product line includes Testo-Cream (one formula made for women - and one made for men), Progesterone Cream - AND - Estriol Oil for vaginal use.